Increasing numbers of discerning visitors are discovering the exquisite green landscapes and vibrant culture of Asturias and Cantabria. The Atlantic coast, from the Pyrenees to the Portuguese border, is at its most scenic here, while the mild climate has created lush meadows and broad-leaved forests – a scenic paradise indeed. The jewel in the crown of Asturias is undoubtedly the city of Gijon, an industrial port and cultural capital that is both refined and ‘real’ – this isn’t a tourist enclave, but rather a living, breathing Spanish city that has been untouched by mass tourism. Gijon’s history is shrouded in mystery until the 13th century – in 1270, the Spanish King Alfonso X bestowed the settlement the status of Puebla (village). 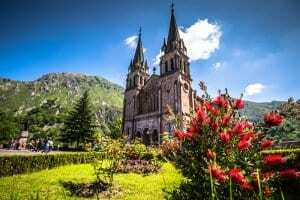 However, Northern Spain and indeed Asturias boasts a long and turbulent history – nomadic tribes and neolithic farming communities were eclipsed by settlers from the Mediterranean, who were in turn supplanted by the Romans. They came to Spain to fight the Carthaginians and take possession of the Iberian Peninsula’s huge mineral wealth. Nevertheless, it took 200 years to subdue Spain. Unfortunately for the Romans, the fall of the Empire in the 5th century left Spain in the hands of the Visigoths, invaders from the north. In the 6th century, Asturias fell under the control of the Visigoth King Sisebut, although at this point in history it is unclear if Gijon existed as a settlement at all. However, there is historical evidence that after the Moors conquered most of Spain following their invasion in 711, Gijon, or rather the land where modern-day Gijon stands, fell under the control of a Berber governor known as Uthman ibn Naissa or Munuza. In 718 the tide started to turn, and a Moorish force was defeated by Christians at Covadonga in the Picos de Europa. Asturias subsequently became one of the first Christian Kingdoms of Spain, although the Moors made several attempts to reconquer their lost territory. Thereafter there is no reliable mention again of Gijon until 1270. But we are certain that forces from Asturias helped to regain land from the Moors in the 11th century and that by the 1400s, only parts of Andalucia remained under Muslim control. After Alfonso X of Castile officially recognized Gijon as a village in the 13th century, the settlement grew in importance as an Atlantic port. Sadly, the good times would not last – the war in the late 14th century between Henry III (Prince of Asturias) and Alfonso Enriquez of Castile totally decimated Gijon. However, the 15th and 16th centuries would see peace and prosperity return to this corner of Asturias. In the same year (1492) that the Catholic Monarchs captured the last Moorish stronghold of Granda, Columbus discovered the Americas. Subsequent trade with the New World brought unprecedented riches to Spain – coastal cities such as Gijon benefited enormously from the new trade routes and the town was endowed with many fine new buildings, a new dock, and improved port area. This prosperity continued into the 17th century, during Spain’s Golden Age. This era gave birth to Spain’s most famous artists – El Greco and Velazquez – and writers, especially Cervantes and Lope de Vega. Gijon’s importance as a port of commerce grew, as did the mansions which soon became an emblem of the town. Yet all was not well in Spain – ruinous wars with the Low Countries and France led to economic deterioration and the good times were about to end. 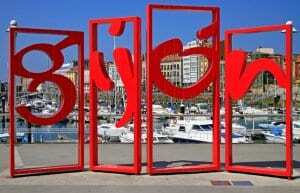 The 18th century brought both hardship and good fortune to the people of Gijon. The death of Carlos II signaled the end of the Habsburg line and Felipe V, the first Bourbon King, ascended the throne in 1700. Spain was henceforth ruled as a centralized nation after Felipe V defeated the forces of Barcelona in 1714. Later in the century, Gijon benefited enormously from the creation of the Oviedo-Gijon road, which helped to encourage further trade and the industrialization of Asturias. This century also saw the birth of the city’s most famous son, Gaspar Melchor de Jovellanos, an eminent author, reformer, and diplomat. The 19th century was no less contradictory, a time of economic growth, industrialization, and bloody conflict. Gijon was by now a thriving city, well-placed to take advantage of the growing importance of mining coal and European trade via its excellent infrastructure and in particular its expanding port. In fact, a new port called el Musel was built in 1893, the first point of entry for coal into Spain. Hand in hand with this impressive economic growth was rapid urbanization – new streets, squares, and neighborhoods such as La Calzada sprung up, and Gijon’s population ballooned during this period. Meanwhile, an invasion by revolutionary France led to the War of Independence or Peninsula War. Later came the Carlist Wars – caused by another dispute of the succession – liberal revolts and the short-lived First Republic. The defining moment of the 20th Century was the start of the Spanish Civil War in 1936. On 17 July, Nationalist generals rose against the Republican Government and declared Franco head of state on 29th September. Gijon sided with the Republicans and fierce fighting broke out until August when the resistance was wiped out. Subsequently, Nationalist troops captured Gijon in October 1937 and occupied the city until the end of the war in 1939. After the War, Franco tightened his grip on Spain, outlawing the regional languages and unifying Church and State. Gijon breathed a sigh of relief in 1975 – Franco’s death and the transition from dictatorship to democracy proved surprisingly swift and painless. The previously-outlawed Socialist Worker’s Party won the general election in 1982 and set about modernizing Spain, devolving considerable power to regions like Asturias. Unfortunately, the last decades of the 20th century saw the decline of once prosperous metallurgical and shipbuilding industries, as competition from emerging economies made these enterprises unprofitable. Nevertheless, Gijon greeted the 21st century with optimism – new industries have emerged and the city increasingly benefits from both domestic and foreign tourism. Yet the beauty of Gijon is its timeless quality, typified by a leisurely stroll through the city’s charming old town, situated on a small isthmus and headland. Known as the “Barrio de Cimadevilla,” it centers on the arcaded Plaza Mayor. Locals gather there in their droves to sip wine and sometimes listen to the powerful melodies of Asturian bagpipers, who often can be seen in the old town. Masters of the Gaita Asturiana, they are a fitting emblem of a city that, while contemporary and modern, also proudly clings to its fascinating past. 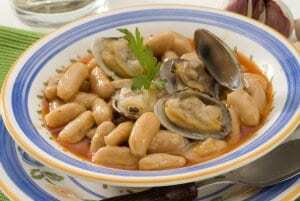 Asturias has always been self-sufficient in the gourmet food department, which ensures that any meal in Gijon is usually excellent and often memorable. Indeed, foodies and chefs who care to forage in this exquisitely beautiful and misty land will encounter no end of delights; game birds, wild boar, deer, sheep, and cattle roam freely in the Picos de Europa. Meanwhile, the Atlantic provides all the fresh seafood and fish a visiting sybarite could want. Scallops, hake, monkfish, spider crabs, lobster – the list is endless. Freshwater rivers keep market stalls readily supplied with wild salmon, another highlight of local gastronomy. The choices aren’t vast; Asturias is the only region in Spain without a longstanding legacy of wine production. However, a rising number of family-owned vineyards are forging reputations for themselves, using mainly indigenous varieties such as Carrasquín and Castro de Limes. Finally, don’t forget to sample one of the delicious local cheeses before you leave Asturias. It is the region in Europe that offers the widest range of cheese, rightly referred to as “el pais de los quesos” (land of the cheeses). Aficionados always swoon over the pungent and strong-tasting Cabrales, a hard blue cheese which is traditionally matured in mountain caves across the Picos. Los Beyos is another highlight, a pungent cheese made from cow, ewe or goats’ milk. Gamoneu and Penamellera are no less divine. This is something very special. Gijon’s pride and joy, the Atlantic Botanical Garden specializes in the flora and diverse vegetation of the Northern Atlantic. It is organized into four main collections: local flora, plants of the Old and the New Worlds, a recreational garden from the 19th Century, and the main biomes from both shores of the ocean. A must visit. The very epitome of picturesque, Tazones is a delightfully sleepy fishing village that comes alive in the summer months. Marvel at its timeless beauty and stay for dinner. Fresh seafood doesn’t get any better than this. Welcome to the heart and soul of Gijon. Located on a small headland, Gijon’s old town is full of lively tapas bars, an ideal place to sip cider and watch the world go by. The architecturally splendid Plaza Mayor and the 18th-century Palacio de Revillagigedo, a Neo-Renaissance folly with towers and battlements, provide the cultural juxtaposition to all that hedonistic pleasure. A visit to one of the traditional cider houses in Gijon cannot be missed. Delicious tapas and larger plates accompany only the best local cider, often served from a great height. Arrive hungry!